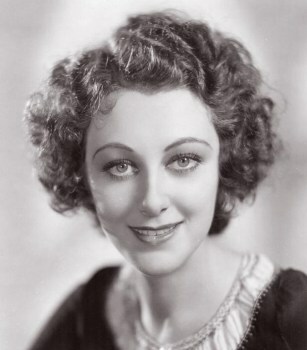 Ann Dvorak was born into an acting family and, after starting her career as a child star in silent movies, she became a well known Hollywood actress in the 1930's and 1940's. Her unusual surname was a stage name taken from her mother's side of the family. Her career was severely curtailed almost as it began when she defied her studio, Warner Brothers, by taking an unauthorised eight month break to go on honeymoon. When she returned the quality of the movies she was offered was markedly lower and her career suffered badly. She was born Ann McKim in New York City on August 2, 1911. Her mother was silent film star Anna Lehr and her father, silent movie director Edwin McKim. Ann had a conventional middle class education, attending St. Catherine's Convent in Manhattan and the Clark School For Girls on West End Avenue. Her home life was anything but conventional, however. In 1919, during a visit to Cuba to make a film for the Biograph company, her parents quarrelled fiercely and made the decision to separate. They divorced in Philadelphia in 1920. Ann did not hear from her father after that for fourteen years, when, as a well known actress in 1934, she advertised for information about him. Her father was the seventh man to respond. He had seen pictures of the famous actress but had no idea she was his daughter. After the divorce, Ann and her mother travelled to Hollywood and Ann enrolled at the Page School for Girls in Highland Park, California, graduating, aged 16, in 1927. Ann first appeared on film as a child actress, known as "Baby Anna Lehr". Her debut film was 'Ramona' in 1916, aged 5, and she continued in children's roles in 'The Man Hater' the following year and 'Five Dollar Plate' in 1920. Ann had a natural talent for dancing and in 1928 she worked for two years at MGM as choreographer's assistant. During this time she became friendly with fast-rising star, Joan Crawford, who tried to help her win roles in films. Ann first signed for MGM in 1929 and used her mother's name, Anna Lehr, as her stage name She appeared, uncredited, as a chorus girl in many early sound movies such as 'The Hollywood Revue of 1929 ' and ' What Price Melody?' in 1930 . Her fortunes changed when a friend introduced her to Howard Hughes and she was groomed by his company, RKO, for film stardom. In 1931 she got her big break when she was chosen by director Howard Hawks to play the sister of Paul Muni's character in 'Scarface', which became a huge hit. Around this time she began using the old Czech family name of Dvorak, although she at first spelt it several different ways such as Devorak and d'Vorak, ultimately deciding on the spelling we know today. The name is believed to come from her mother's family and there is no connection with the famous Czech composer, Antonin Dvorak. After the success of 'Scarface' Ann's contract was purchased from Howard Hughes by Warner Brothers for $40,000 and her workload increased significantly. In 1932 she made one of her best known films 'Three on a Match' with Joan Blondell and Bette Davis, followed in the same year by 'Crooner' and 'The Crowd Roars'. It seemed that she was set for a hugely successful movie career. Ann's own actions, however, would lead to a different outcome. In July of 1932, Ann married British actor and director Leslie Fenton, who she had met earlier in the year on the set of 'The Strange Love of Molly Louvain'. Fenton took his new bride on an extended honeymoon, touring the UK and Europe. It proved to be a disastrous move for Ann's career as she gave Warner Brothers no notice of her intentions and was breaking her agreement with them right from the start. She returned from her trip after eight months but her career was never the same. Warners continued to give her work but without the star build-up she had previously enjoyed. She appeared in routine 'B' movies such as 'Midnight Alibi' and 'Friends of Mr. Sweeney' in 1934, 'Thanks a Million' in 1935 and the Perry Mason movie, 'The Case of the Stuttering Bishop' with Donald Woods in 1937. Of slightly better quality was the comedy 'Merrily We Live' in 1938. At the outbreak of WWII in 1939 Leslie Fenton returned to his native England where he became commander of a British PT boat and was wounded in a raid on the port of St Nazaire. He received the Distinguished Cross for his service. During this time Ann served in the MTC (Mechanised Transport Corps), a civilian unit in which she drove an ambulance round London. She also appeared in two wartime films in England, 'Squadron Leader X' in 1941 and 'This Was Paris' the following year. When she returned to Hollywood after the war, Ann spent more time appearing on stage and in 1948 she appeared for a year in 'The Respectful Prostitute' on Broadway. On the big screen she did not find any improvement in the scripts she received and she continued to appear in the bland 'B' movies as before. An exception was 'I Was an American Spy' in 1951. After 'Secret of Convict Lake'. later that year Ann retired from movie making. She continued for several years to act on the new medium of television in such programmes as 'The Bigelow Theatre', 'Broadway Television Theatre' and 'The Ken Murray Show'. After 1952 Ann retired completely from acting and spent time with her third husband at their home in Hawaii. She pursued many interests such as rare book collecting, song composing and horticulture. Ann was married three times. Her marriage to Leslie Fenton lasted from 1932 to 1946 and the following year she married Igor Dega, a Russian dancer whom she had met whilst making 'The Bachelor's Daughters' in 1946. They divorced after two years and Ann married her third and last husband, Nicholas Wade, in 1951, the marriage lasting until his death. Ann Dvorak died in Honolulu on December 10, 1979 from stomach cancer. She was cremated and her remains were scattered off Waikiki Beach.